Cooking in someone else's kitchen: Is it a bird? Is it a frog? Some creature was making an extremely peculiar noise up by the pond this morning. Any ideas what it might be? The Queen Anne's Lace (Daucus carota) flowers are opening up. I really like the delicate basket-work tracery of the green bracts underneath the flower heads. 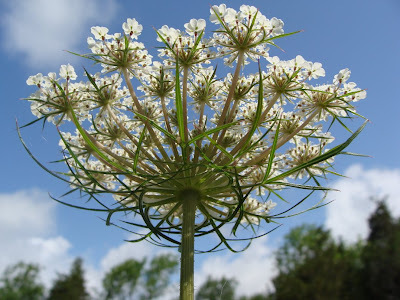 That is a gorgeous shot of the Queen Anne's Lace, a flower I dearly love. I know, I've just got to be patient! I haven't bought any fresh tomatoes for weeks, so my anticipation is reaching fever-pitch. I'm sure I'll be sick of having to process them in a month or two (I have rather a lot of plants...)! That's a perfect angle to shoot a picture of Queen Anne's lace. It makes the more lovely. I think it is a bird.....am I right? Mo - I've no idea! But I think you might be right, as it stopped when I got closer and so might have flown off. It was a very weird noise.